April 2019: NSW has a new Planning minister, Rob Stokes. Now is the time to get on his new agenda and demand a review of the proposed plans for unprecedented density in Waterloo that would be more than Green Square in this heritage area. What the Government is planning in Waterloo is unprecedented for Australia and the density of Hong Kong. They want to increase the number of homes by a staggering 388 per cent, from 2,012 to 6,800 in approximately 17 tall towers, up to 40 storeys in height. Next door, the Metro Quarter development will add another 700 apartments in three towers up to 29 storeys in height. retain and refurbish the Matavai and Turanga towers rather than raize them and replace with more of the same height. 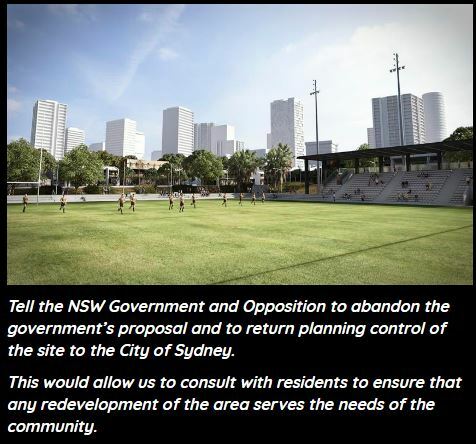 EMAIL office@stokes.minister.nsw.gov.au to call for an urgent review of the state government’s approach to the development including returning the area to the City of Sydney for delivery. STAY IN TOUCH WITH THE CAMPAIGN: Click here to support City of Sydney’s alternative vision for the Waterloo precinct. No Replies to "SIGN UP TO SAVE WATERLOO"